Learn about the difference between Presenter Pace and Audience Pace - when you present. 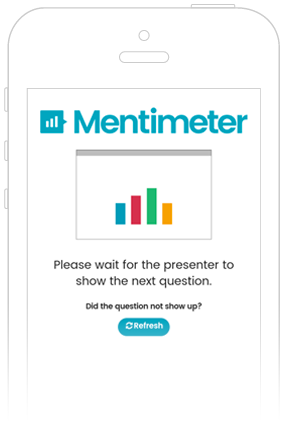 As you might already know, Mentimeter offers two different ways for your audience to move forward in your presentation: Presenter pace or Audience pace. To learn more about the different modes, you can read this article about Live Presentation or Remote Survey. When you present, you see no effect of the voting pace in the presentation itself. Instead, what will be affected is the way your audience move through the presentation in their devices. For the first situation, the audience gets the message "Please wait for the presenter to show the next question". The next question will then show up automatically as soon as you activate it by showing it in your presentation. For the second situation, the audience gets a smaller notification informing them that you moved on to the next question. They can then choose to stay on the previous question and submit their vote, or move on to the question you are showing. With Audience pace activated, the participants will instead start from the first question and move on in their own pace until they have answered all questions. You can still show the results in a live presentation - for example, presenting the results from a meeting check-in questionnaire!